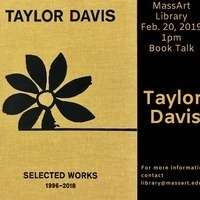 Come join us at the MassArt Library to hear about Professor Taylor Davis's new book. "Designed in collaboration with Purtill Family Business, this comprehensive monogram of Davis’s sculptures, paintings, and collages includes texts from 19 contemporary artists, activists, art historians, critics curators, designers, and poets, who chose and responded to specific works. Contributors are Anselm Berrigan, Michael Brenson, A.K. Burns, Dan Byers, Ruth Erikson, Rochelle Goldberg, Fanny Howe, Richard Klein, Ann Lauterbach, Catherine Lord, Helen Molesworth, Ulrike Müller, Jenelle Porter, Conny Purtill, Lucy Raven, Leslie Scalapino, Nancy Shaver, Oliver Strand, and David Levi Strauss."